Each September, Arts Visalia celebrates the work of artists of the Central California region who are known for their three-dimensional or sculptural creations. Titled That Extra Dimension 2013, this annual exhibition serves as a vital survey of the works of such artists from throughout this area, providing an exciting and enjoyable exhibition for visitors to Arts Visalia. Among the primary goals at Arts Visalia is the promotion of the visual artists of our local and regional community as we strive to shine a light on the depth of talented individuals with Tulare County and Central California roots. Many of the artists with work in the show have participated in past installments of the exhibition, others are new exhibitors at Arts Visalia. Each brings something unique in terms of their personal creative expression to the exhibition. The varied materials and skillful manipulation of those materials which each artist brings to bear on their work underscores the quality and diversity of the creative work being made today. Some works are beautiful in their form, some whimsical and playful, while others ask the viewer to contemplate questions surrounding the meaning of the work. Consistent throughout is the craftsmanship and creativity brought to the works by each artist. Artists with work in the exhibition include Mark Ahlstrand, Toni Best, Verne Chapman, Carole Clum, Antonio Cuellar, John Friedrich, Ed Gillum, Nancy and Jerry Jonnum, Shirley Keller, Kris Kessey, Paul Lagatutta, Moni Mauch, Diana Pearcy, Esther Perez, Mike Perez, Marn Reich, Andrew Turner, Linda Victory, Dolores Witt and Russell Wright. 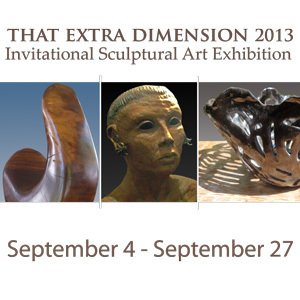 That Extra Dimension 2013 will be on display at Arts Visalia from September 4th through September 27th with an opening reception to be held Friday evening, September 6th, from 6 to 8pm. Admission is free and open to the public.